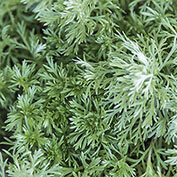 Silvery, very finely dissected foliage is soft to the touch. Silver Mound is now available in gallon pots and shipping now. 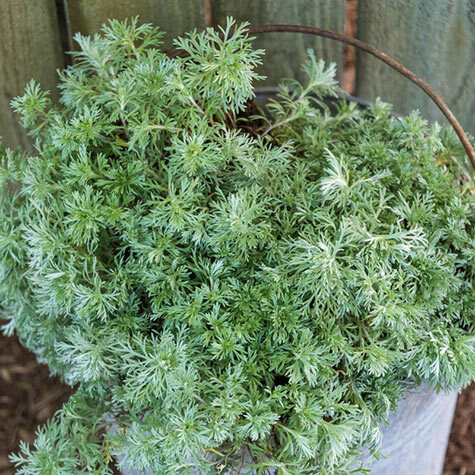 Growing 8-12 inches tall with a 10-15 inch spread, Silver Mound is a good choice for planting in borders, rock gardens and as a ground cover. Grows best in full sun. Potted. Zones 3-8. 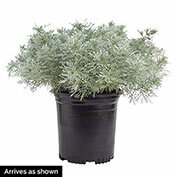 Color: Silver foliage, with hints of green. Foliage: Silvery, very finely dissected foliage. 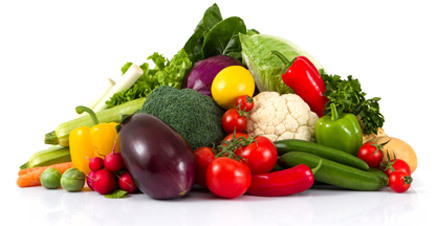 Soil Requirements: Moist, but well-drained, average soil. Does not thrive in heavy, clay soil. Pruning: Cut back to the base of the plant in autumn or early spring to maintain its compact, mounded habit. Comments: Attractive foliage is so soft and feathery. 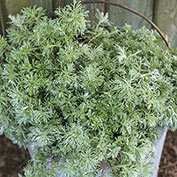 This valuable garden specimen blends well with dark foliage and white flowers.